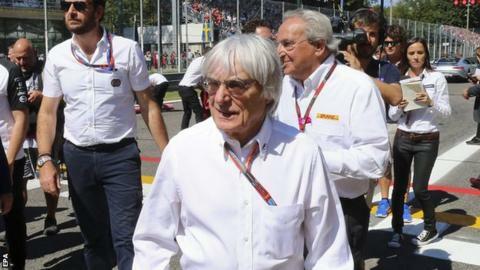 Formula 1 may be sold this year to one of three interested buyers, the sport's boss Bernie Ecclestone has revealed. The 84-year-old has not identified the potential buyers, but said he had been asked to remain as commercial chief, a role he has held since 1978. Stephen Ross, the owner of NFL side Miami Dolphins, has been working with investors from Qatar to buy a stake in the sport. Investment fund CVC Capital Partners is F1's controlling shareholder. Ecclestone said: "There has been a lot of interest and there are three [interested parties] at the moment. "I will be surprised if one of them does not buy them shortly." Asked when he expects to see a new owner in F1, he replied: "This year." Ecclestone has a 5.3% stake in F1, while CVC owns 35.5% after initially gaining control of the sport in 2006 for around $2bn. Mercedes team boss Toto Wolff told the same conference that it is important to have a "sustainable shareholder with a long-term perspective and vision". "Will F1 get new owners this year? Of course, it's possible - like all businesses in which shares are traded, its equity can be bought and sold by investors. "But many will be sceptical of the possibility, of why Bernie Ecclestone has said this, and why now. "There was a flotation planned a few years ago. Didn't happen. Periodically stories emerge suggesting there are parties interested in buying F1. They rarely come to anything. "F1 can be a dark world in which what is said is not always what is meant. Meanwhile, Ecclestone himself is a master of misdirection and manipulation. "Equally, main shareholder CVC Capital Partners has shown no inclination to sell up - and its boss Donald MacKenzie is said to have grown quite fond of his role and influence in F1. "A sale might happen - but for most F1 insiders this will get filed under 'believe it when you see it'." Is Formula 1 losing its soul? Read more on Allan McNish column: Is Formula 1 losing its soul? Can we believe Koch's world record? Read more on Marita Koch: Can we believe her 400m world record is genuine?